What makes these bars stand out so much is the homemade filling. Don’t get me wrong though, the crust made with almond flour, honey, and coconut oil is fantastic. And the walnut crumble topping is spectacular as well. But the real star is the filling. While this recipe makes raspberry crumble bars, the raspberries can easily be swapped out for your favorite type of berry to make strawberry or even blueberry crumble bars as well. Whatever type of berry you decide to use, the three tablespoons of honey help to give the filling the texture you’re looking for. These breakfast bars aren’t meant to be overly sweet, so adjust the amount of honey you’d like to add depending on your personal preference. The lemon juice and lemon zest add that perfect tangy flavor to the filling. However, if you’re using very ripe fruits that are already very sweet, you could reduce the amount of lemon juice. You could also use lime juice and/or lime zest for a slightly different flavor. To top it all off, two tablespoons of chia seeds are added in to really push the filling over the edge. Chia seeds are an incredibly popular superfood, and for good reason. These little seeds pack quite a healthy punch of nutrients in a small package. They’re a quality source of protein, fiber, and antioxidants that provide your body with numerous health benefits. (1) Chia seeds are often used as toppings in recipes, but they actually act as binders especially when the liquid is added, resulting in a gel-like consistency. Did you know you can make crumble bars in bulk to save you some preparation time? That’s right, you can make large batches of these and store them in the freezer. Or, you could simply store these in the fridge in an air-tight container. The lemon juice and honey help to preserve the crumble bars for 3-5 days. 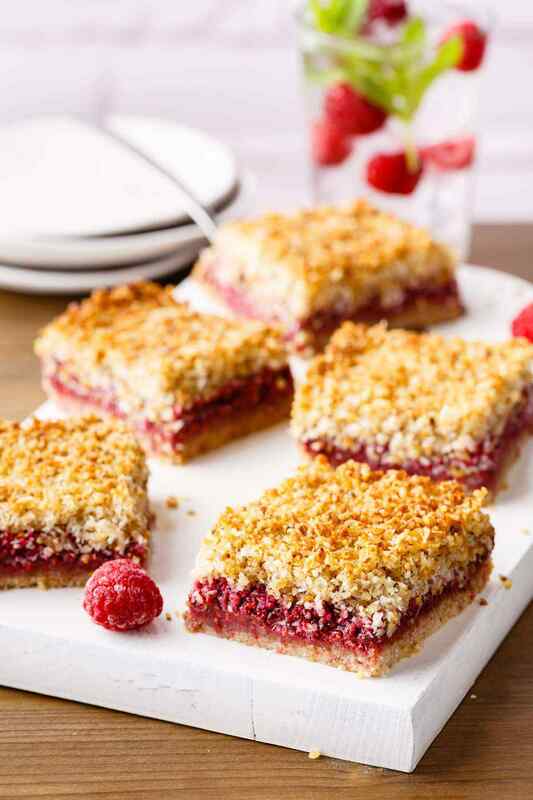 Raspberries are used in this recipe since they’re my favorite way to make these crumble bars. No matter what type of berry that you use though, you really can’t go wrong with these. They’re a perfect portable breakfast or healthy snack to grab for whenever you’re on the go and craving for something light and sweet. If you’re a fan of making all sorts of paleo energy bars and snacks, be sure to check out this extensive list of 40 excellent paleo energy bars that are all totally healthy and completely paleo-friendly. And if you’re looking for something else that’s just a bit tangy and tart, we’ve also got 15 excellent gluten-free rhubarb dessert and treat recipes. Lastly, you need to try these raspberry cheesecake bites. 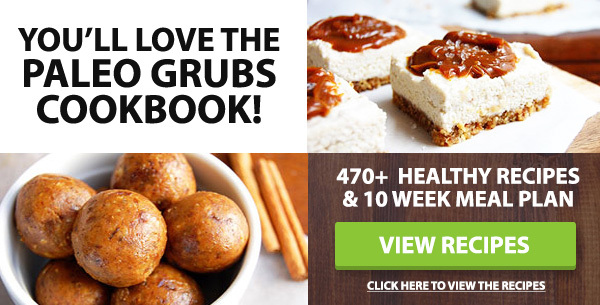 I thought I had to give up cheesecake when I switched to paleo, but these are amazing.